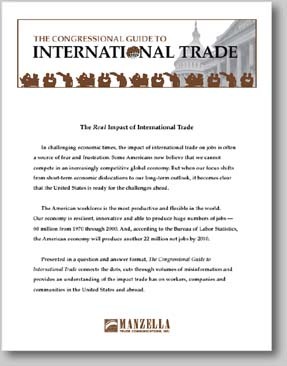 Manzella Trade Communications researches and publishes custom reports, guides, position papers, and white papers to educate audiences on global business and economic issues. Distributed to Members of Congress by Rep. David Dreier (R-CA) and Rep. Cal Dooley (D-CA). See their letter on page 2. As U.S. employment increases, manufacturing jobs continue to fall. Many blame this trend on international trade, especially rising imports and worldwide sourcing. But careful analysis reveals that imports and global sourcing are not the cause of the decline in the manufacturing sector. Presented in a question and answer format, this publication cuts through volumes of misinformation and provides an understanding of the impact trade and globalization have on workers, companies and communities in the United States and abroad. Produced on behalf of the Business Roundtable and goTRADE New York, International Trade Benefits New York provides analysis on the importance of trade to New York State and its major metropolitan areas. The report generated more than 20 articles in newspapers in New York state, including The New York Times, and its analysis was cited on the House floor by Rep. Tom Reynolds (R-NY) immediately prior to the September 27, 2002 vote on Trade Promotion Authority.  Averting Disaster: The Future of Cargo Security and How Supply Chain Manager Must Prepare provides the essential steps.  The Public Relations Q&A Guide to Corporate Downsizing gives executives and public relations professionals the valuable tools they need to better communicate difficult corporate decisions.  Louisiana Export Statistics Study demonstrates the importance of exports and foreign markets to the Louisiana economy.  Kansas Export Statistics report demonstrates the importance of exports and foreign markets to the Kansas economy.  Oklahoma Export Statistics report demonstrates the importance of exports and foreign markets to the Oklahoma economy.  Trade briefing requested by Governor Pataki (R-NY) for use during a National Governors Association White House breakout session with the Secretary of Commerce and U.S. Trade Representative.  The Impact of Chinas WTO Accession on New York State.  China position papers on the Normal Trade Relations status (formerly Most Favored Nation) and Permanent Normal Trade Relations.  Fast Track position paper on granting President Clinton Fast Track Negotiating Authority.  GATT Position papers on the GATT Uruguay Round Agreements.  New York for NAFTA position papers on the North American Free Trade Agreement.  The Impact of Free Trade on the Global Economy, the United States, Mexico, and Investment.  The Impact of Free Trade on the Global Economy, the United States, Mexico, and Energy.  How Global Trade, NAFTA and the Peso Crisis Impact Mexico's Economy and Food Industry.  The Impact of the North American Free Trade Agreement on Mexico, its Financial Sectors and the Consumer Credit Insurance Industry.  Exporting to the United States.  Multi-Purpose Canadian Investment Study. Request more information on Custom Reports and Position Papers.